Our Double-Decker Tacos are twice as good as regular tacos. 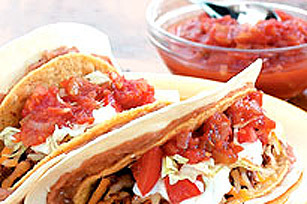 Made with seasoned ground beef and taco toppings, they each have a crisp corn taco shell and soft flour tortilla wrap. Spread tortillas with beans. Place taco shell on centre of each tortilla. Fold edges of tortillas over top edges of taco shells; fill with meat mixture.